Prime Time Manufacturing was founded in 2009 by the team of managers and engineers with long experience in leading companies in RV industry. Believing that the major part of success is not only vision and creativity but also the quality of craftsmanship they decided to settle in Northern Indiana (Wakarusa). Located in the heart of Amish community, the company (as well as its customers) can benefit from Amish’s hard to match work ethics deeply rooted in their “philosophy of life”. 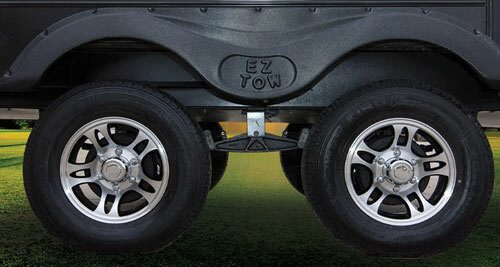 The LaCrosse 337RKT is the “Fifth Wheel” on Travel Trailer frame (it should be not surprising given the fact that 5th wheels make substantial part of Prime Time’s production offer) ….. The front bedroom and rear-end kitchen layout with central living area seems to be the preferable concept for residential-style RV. 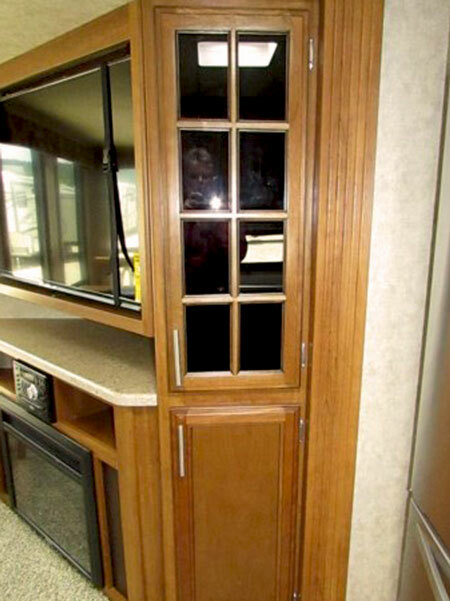 It somehow separates the kitchen from the remaining part of the “residence” exposing the living room (salon) as the main section of the trailer. Two- opposite side slide-outs make the living room spacious (and it’s is not only feeling, it’s the fact). 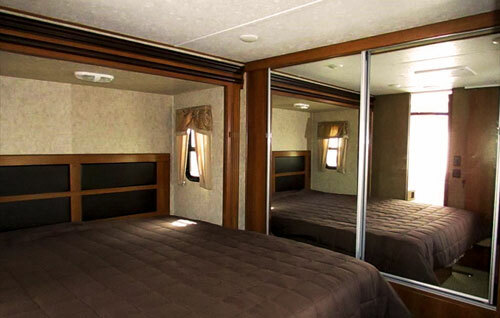 The front bedroom also takes advantage of the slide (trailer’s 3rd one) offering enough of space for king size bed. Its wrap-around layout with the large sink cabinet separating kitchen from the salon offers a residential-like feel. It’s because the kitchen still is an integral part of the “residence” but at the same time it is somehow “contained” at the back. Stainless steel appliances and Corian-like countertops not only add elegance, but also promise easy maintenance and long lasting, hopefully “trouble-free” operation. The oversized dual-door 20 cubic feet refrigerator with equally enormous freezer (bottom drawer) may well meet needs of any real residence. 3-burner range with large oven and hood with lights and exhaust vent comes with flush-mounted cover. The microwave mounted above the range’s hood completes the list of kitchen appliances and (what is definitely more important) – offers great opportunity to prepare favorite meals you got used to when home. 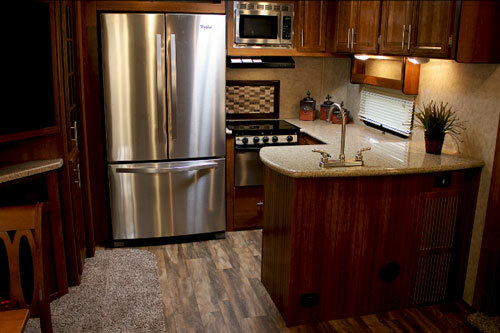 Solid wood core cabinets with golden cherry doors (BTW – this applies to all cabinetry throughout the trailer) match the elegance of appliances and nickel fixtures and hardware. The drawers installed on ball-bearing full extension glides promise practicality and lasting (good) experience. 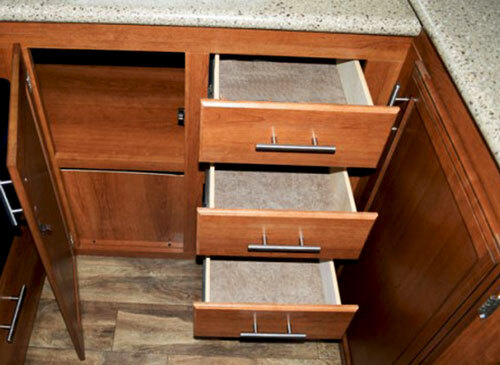 Deep pantry with removable shelves greatly contributes to always “on demand” kitchen storage space. 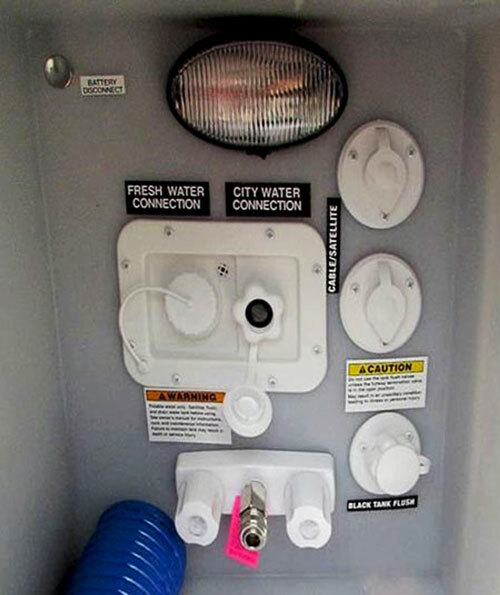 And finally, the double-bowl sink with high-rise faucet and pull-out sprayer can bring to otherwise “dirty” job of washing and cleaning “more pleasurable” accents. Just a bit farther (but still comfortably close to the ”meal-creative-area” you will find the free standing table with 4 chairs. It shares the curbside slide-out together with the pantry and entertainment center. 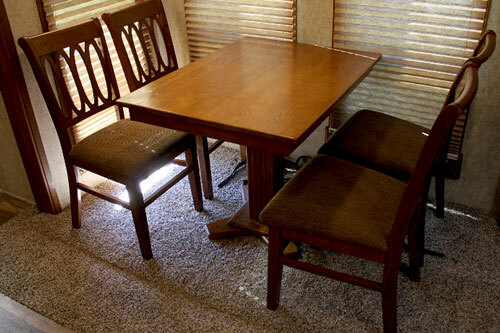 While typical U-shape dinette may offer more seating place, the free-standing table with chairs is what makes you feel like dining in one of high-end restaurants. If you did not expect it - here is the little secret: underneath of cushions in each of four chairs there is a hidden “little” storage for all kind of “small stuff”…. 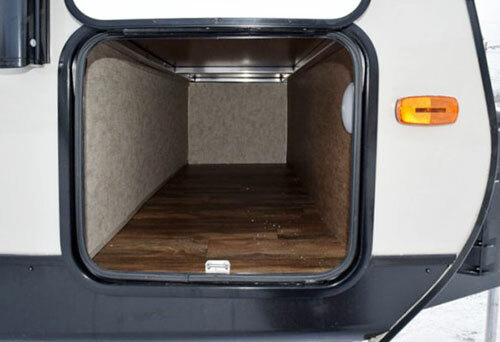 (Do not worry, for ‘big stuff” there is plenty of space in storages with an outside access and eventually, if needed on the walk-on roof). The salon occupies the central section of the trailer largely extended by two opposite-side slide-outs. 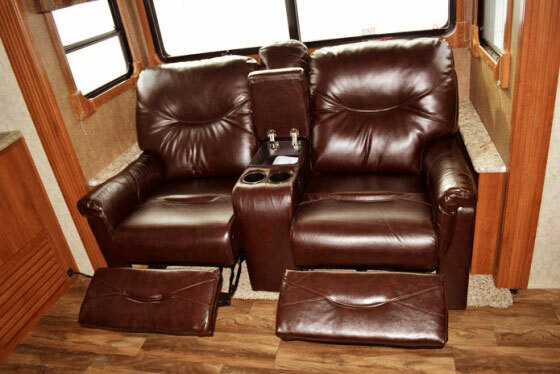 The one on the driver-side includes the Theater-Seating in form of two leather recliners. Two cup holders certainly help to fully relax when enjoying TV programs of soothing music. 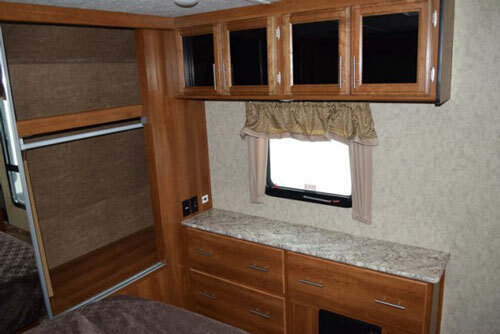 The leather “hide-a-bed” sofa facing kitchen and the entertainment center provides seating and extra sleeping place for two. 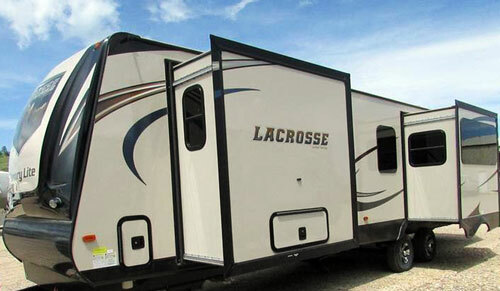 Indeed, despite its large size, the LaCrosse 337RKT is designed for only four people so it is never overcrowded. The entertainment center is placed at 45 degrees so you can see the TV screen from any place – be it the dining room, sofa or recliners. Even more – the TV is mounted in the fixture allowing the screen to turn left or right to such extent that if needed, it can be watched straight from the kitchen. The 5k BTU electric fireplace below the TV is another focal point much appreciated during chilly evenings. The space is absolutely precious in any residential area, so to help maintaining this ambiance the trailer was built with unusually generous headroom of 82 inches and arched ceiling. The large Atrium windows especially during a day help to fill the space with light and bring outside world in. Maybe worth to mention – Atrium windows are specially designed to keep interior cool during the summer and warm in winter (thanks to heat-reflecting layer). 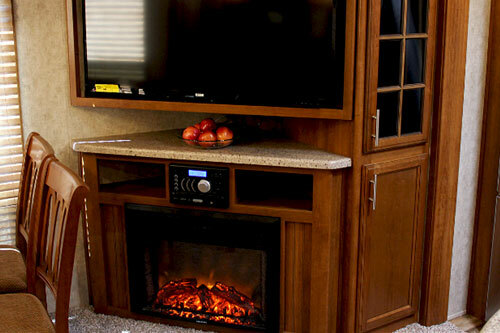 The king-size bed with Evergreen mattress is not often seen in travel trailers, but luxury obliges. The front cap holds large wardrobe with the large hanging section and several shelves. Sliding mirror doors create the impression of much bigger space. Across the bed there is the dresser and main window (in case of emergency can be used as an exit). Above are hanging overhead cabinets. 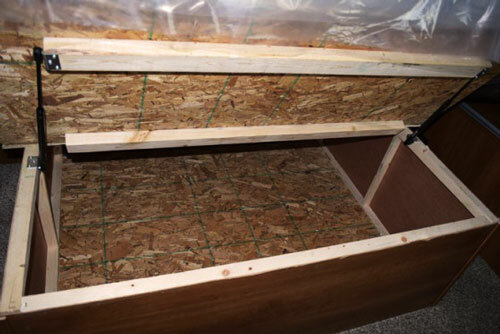 But that is not all when it comes to storage – there is also the spacious under-bed box that can be used for “stuff” (whatever it may be) given the fact that gas-struts make the access very easy. What is missing? Probably small nightstands or whatever next to the headboard that can be used for evening book, newspaper of morning cup of coffee…. May be just shrinking king-size bed to queen will open some space for this very modest need. The optional TV (if that is what you need in the bedroom) can be easily installed given availability of dedicated hook-ups (cable and power). BTW –converter offers possibility to use both - 110V and 12V energy sources at the touch of the switch. The master bedroom has the private access to the next to it bathroom via sliding doors. 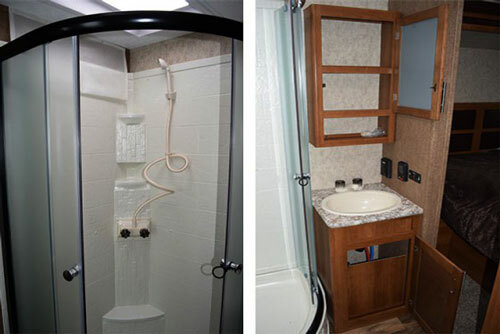 The focal point of the bathroom is the elegant radius shower cabin with glass doors. The skylight above the shower keeps privacy allowing only sunlight to enter the cabin. Next to the shower there is nice vanity including cabinet with sink and hanging medicine cabinet above. The porcelain toilet with foot-flush is located on the opposite side, leaving place for “common” doors to/from the living room. Hooks for bathrobes and towels complete the picture…. 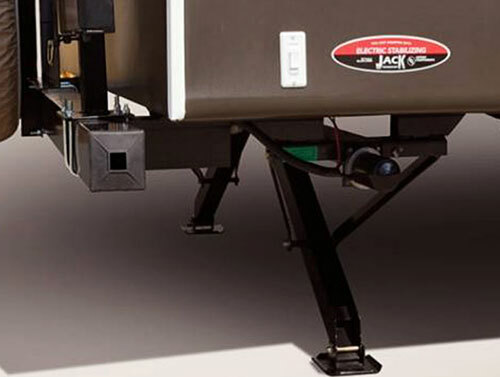 The LaCrosse 337RKT comes with the “one-touch” power awning. It extends the living space behind the hard-walls reaching into the nature. And it can be as luxurious as the interior (although the factory only “opens” opportunities. So for example LED lighting along the awning creates charming evening ambiance. If the “sound-of-nature” does not reflect your preferences, you can easily substitute it with your favorite music thanks to marine grade speakers built-into the external walls. And finally, if being in the middle of nature you still feel the need of watching TV –there is an external TV bracket and set of hook-ups to make it happen. It’s understandable that once you bought the LaCrosse 337RKT, the “Luxury” coming with it should be available year-round instead of being stuck on the parking lot waiting for better weather. That is why the Prime Time Manufacturing offers an optional Extreme Thermal Package. Unclosed and heated underbelly and dump valves as well as heated water tanks offer the good level of protection from water freezing. The extra (R-52 equivalent) insulation of roof, floor and cap on top of already good standard thermal insulation of walls and Atrium-class windows not only makes this travel trailer energy-efficient but also an all-season “home-away-from-home” designed for prolonged stay. The ability to control the interior “climate” by the powerful furnace and Air Conditioner(s) as well as residential charm and “warmness” by the fireplace made it not only possible but also comfortable. On the “slightly” negative note – Luxury obliges and here we noticed the lack of installation and dedicated space for washer/dryer as well as robust solar installation (at least the wire-prep). The first “miss” partially deprives you from privacy during prolonged stays and certainly for some will be considered as an important shortcoming. The second one makes a “dent” in the overall picture of what we consider these days as modern. It’s true that luxurious campers definitely are not designed for ”out-of-grid”” environment , however the Eco-friendliness is not anymore just welcomed, it is expected. Note: Some internal/external features are part of the Mandatory Advantage Package so for simplicity they are considered as standard features. 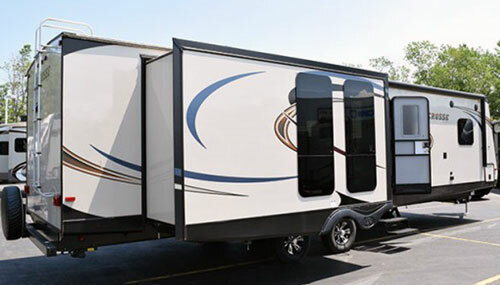 Summarizing: LaCrosse 337RKT certainly belongs to the class of luxurious travel trailers with stylish and elegant exterior look and more than comfortable, residential-like interior. 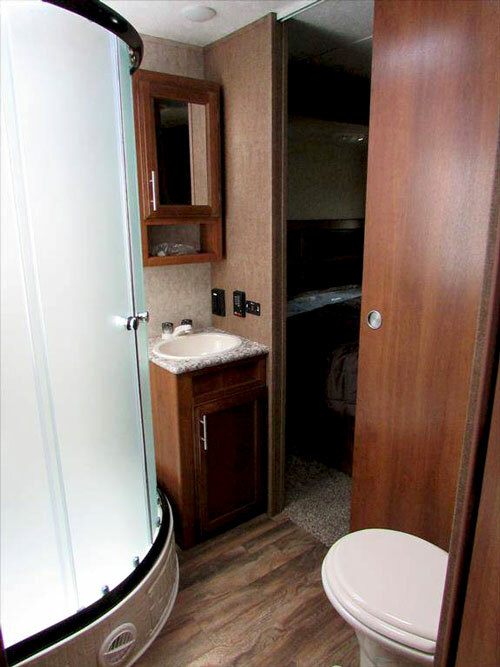 And surprise-surprise – its decent price (mid 40k) makes it available for many potential RVers. As the company rightfully claims: Your search for the (almost) perfect combination of Luxury and Value is over – Prime Time Manufacturing created it! Welcome to LaCrosse.